It's the leaves of this xeric ground cover that people find attractive but it's the inconspicuous white flowers that the bees love, as they do any in the mint family. 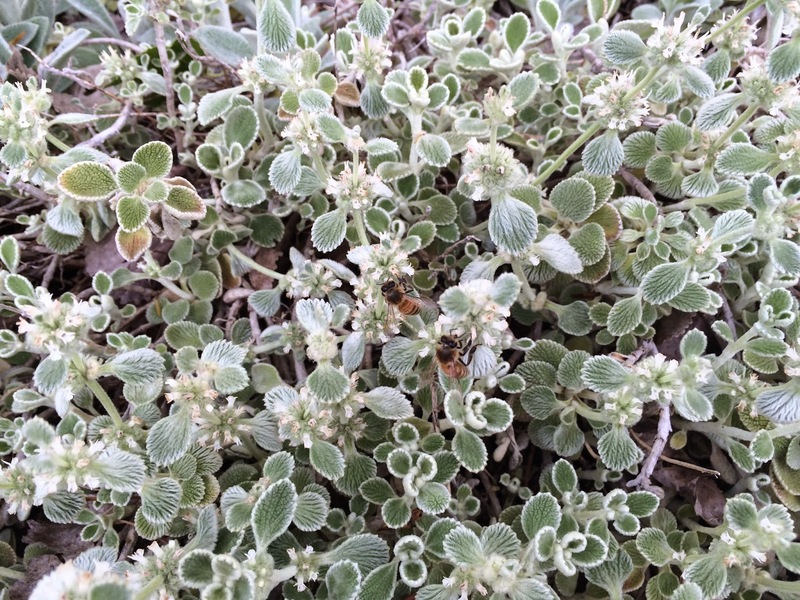 In the Backyard, Silver-Edged Horehound (Marrubium rotundifolium) is planted next to some Lamb's Ear (Stachys byzantina) and is almost easy to overlook. Like the Lamb's Ear, the leaves are pale green with white fuzz but while the Lamb's Ear is an aggressive spreader, the horehound maintains it's tidy 2-foot square area in the garden. It is mat-forming, less than a foot high even in flower, so enjoys a front-edge-of-the-garden place where it can be enjoyed. It thrives in the full Colorado sun, heat and dryness, although its position at the edge of the garden means that it occasionally gets supplemental moisture from watering the lawn. No frame. No filter. Can you guess today's #photojojomacro? Happily the rabbits are not interested in it and this one is over 15 years old, proving that it is a long-lived perennial. This particular clump has been moved a couple of times, so it's doesn't mind being transplanted. I don't think it's picky about soil either but whenever I dig a new hole, I remove some of the clay (I can't stand our native soil) and I work in some compost and a sprinkling of HydroSource. I firmly believe in these water-absorbing crystals to both absorb inordinate amounts of water when it rains (because if it rains it POURS here) and to release that precious moisture when the heat comes (which it does with equal vengeance). The horehound takes the wild swings completely unfazed. 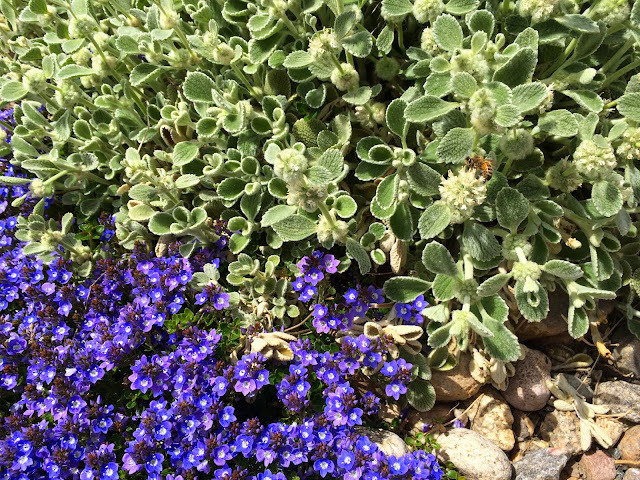 Other xeric plants that make great pairings with it include deep-green leaved Salvia × sylvestris 'May Night', less intense in presence Salvia officinalis 'Purpurascens', and the 2015 Perennial Plant of the Year, Geranium x cantabrigiense ‘Biokovo’. They all bloom later, a good distraction from the need to deadhead the horehound, and the bees love them all. The light on an unusual overcast day brings out blue tones in the leaves. If you can't find it at Timberline Gardens or your local nursery, a great mail order source is High Country Gardens. Out usual full sun brings out a warmer color tone. At Kendrick lake it is paired with a creeping veronica. Glad to have found your blog and took your comments seriously. I'm considering the Horehound as a replacement for my lawn, which is a relatively small area. I'd like your opinion and comment(s), please. I live in "drought-y" Southern California. High Country Gardens (one of my favorite plant vendors) sells Silver-edged Horehound by the flat so I can only assume that some people plant entire areas with it. Give them a call and ask them how it will perform in Southern California.